Planning a trip with your baby? I know it can feel overwhelming, but it’s really a great idea. My first child was four weeks old when she took her first road trip. It was a 2,000-mile vacation that covered four western states. There were a few crazy moments, but overall, it was a great trip. That was 14 years ago, and my daughter is a great traveler today because she’s had so much practice. 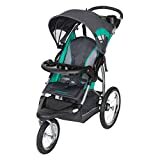 A stroller is an essential item for any trip with a baby or young child. 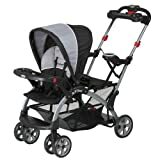 You can rent strollers at many popular destinations, but it’s usually most convenient and comfortable to bring your own. 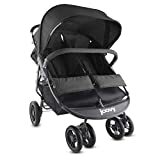 There are a lot of great strollers with different features, and one size doesn’t fit all. Over time, we bought three different strollers for our two children, and each filled a different need. The best stroller is the one that fits your lifestyle and budget. 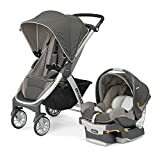 Here are a few features that I valued most in a travel stroller, plus a few top-rated stroller recommendations from Amazon.com. 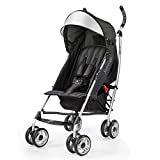 Strollers that securely fit infant car seat carriers are nice because you can move a sleeping baby from the car to the stroller and back again without disturbing her. 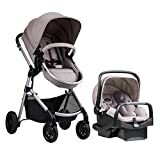 We picked our first two strollers because we liked this feature so much. 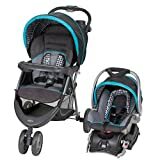 Our first stroller was a versatile and affordable Graco travel system (see top-rated travel systems below.) Our second stroller was a Baby Trend Sit N Stand, which accommodated both a car seat and an active preschooler. 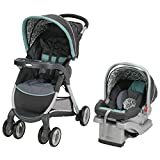 I loved these strollers because they did the job and were relatively inexpensive. However, they were bulky. 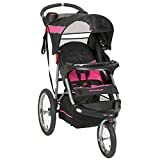 If you really want an stroller that folds small and carries a car seat, consider a stroller frame. 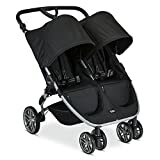 The downside to these is that you’ll need another stroller after your baby grows out of the car seat. When trunk space is limited, it helps to have a stroller that folds small. We took our first trip to Disneyland when my youngest child was 3 years old. My parents joined us on this trip. With six people and their luggage in one minivan, our cheap umbrella stroller was the only stroller that would fit. It wasn’t my first choice for Disneyland, but it worked. Our little umbrella stroller was the stroller we used most for travel after my kids grew out of the infant car seat. It was the easiest stroller to pack and to use almost everywhere. Umbrella strollers are great because prices start at less than $30. They are lightweight and don’t take much space. However, umbrella strollers are not a good option for newborns unless they fully recline. Umbrella strollers may be uncomfortable to push for anyone over 6 feet tall, unless they have adjustable handles. Storage space may be small. One of my favorite stroller features was having a big storage basket under the stroller. When you travel with kids, it’s nice to store all the stuff your family may need in the stroller. These items may include diapers, wipes, snacks, drinks, first aid, change of clothing, souvenirs, and anything else the family might use or collect. 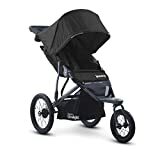 Keep in mind that nearly everything that goes in the stroller basket has to be pulled out before you can fold the stroller. 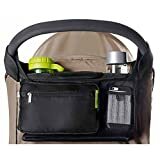 A stroller organizer can be a great accessory to add to your stroller. It will keep the essentials within reach, and save you from digging through the basket for things you need all day. 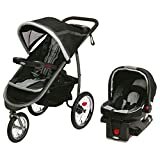 Many families have two stroller-age kids at the same time, and it’s nice to have a stroller that will carry both. 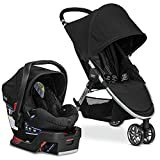 When we had a newborn and a 3-year-old, we liked the idea of a double stroller that was car seat compatible, had lots of storage, and let my active preschooler get in and out easily. The affordable Baby Trend Sit N Stand fit all of these needs. It felt like I was pushing a stretch limo, but it was a good stroller for zoos and theme parks. 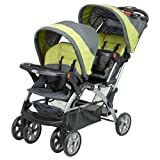 When my sister had her second child, she and her husband chose a side-by-side double stroller. Both seats reclined completely and it got heavy use from the time her four children were newborns through early elementary school. This stroller was more expensive, and didn’t fit a car seat, but it was versatile and served them well for 10+ years. 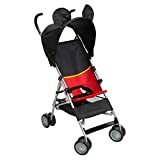 Most strollers have small plastic wheels, and they work fine most of the time. Some strollers have larger wheels – like bicycle tires – with better traction. 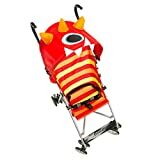 These strollers are easier and safer to push over bumpy terrain, at faster speeds. This was a feature that we didn’t get on our strollers. However, there were plenty of times I would have liked them on uneven pavement, dirt, grass, snow and hills. A good stroller can open up all kinds of travel possibilities for your family. 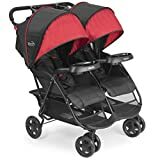 You probably won’t find a single stroller that has all these features, but you should be able to find a stroller (or two) with many of the features that best fit your family’s travel style.